VSBW, a joint venture between VolkerStevin and Boskalis Westminster, was appointed as the main contractor for the marine civil engineering and dredging stage of the Port of Dover’s flagship DWDR development. The £115m contract includes the design and construction of two new deep-sea berths including quay walls and land reclamation as well as a new public pier, the marina curve, navigation channel and new lock gates, bascule bridge and capital dredging works. The Port of Dover was the first UK port to undertake a comprehensive 30-year master planning exercise which looked at the impacts of long term traffic forecasts across all sectors of port operations, assessing the current capacity and the drivers of future demands. 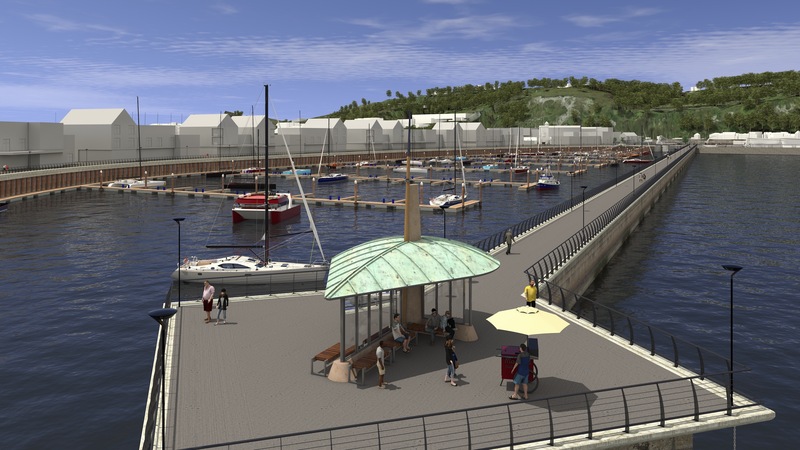 The Port of Dover – promoter of the Dover Western Docks Revival (DWDR) project – has prioritised consultation with stakeholders and the community from the earliest development stages, aware that the proposed changes need to be acceptable to and welcomed by the established Dover community and visitors, and with the Port’s dedicated customer base across all its business streams. This has been undertaken through a variety of means including a special two-week promotion of DWDR at the project’s dedicated Marketing Suite, the quarterly Port and Community Forum (PCF) and Port User Group (PUG), the Marina Users Engagement Group, the monthly Harbour and Leisure Group and numerous one-to-one meetings and presentations involving around 200 different stakeholder groupings. The project’s Marketing Suite is also open to the public every Wednesday to act as a drop-in centre and educational platform for all stakeholder groups. The considerable input and feedback received has been invaluable and the Port worked hard to address all of the concerns and issues raised. This included a number of significant adjustments to aspects of the design. Examples include the provision of a navigation channel through to the Wellington Dock from the new marina, the development of an at-grade (ground level) access arrangement for DWDR (rather than a flyover), the decision to feature the Clock Tower building as a centre piece and retain the Prince of Wales Pier lighthouse in order to preserve these aspects of the Port’s heritage. The ongoing Marina Users Engagement Group meetings are designed to give the marina community an insight into the design principles and keep them engaged throughout the design and construction stages of the DWDR project. Full heritage recording took place before construction work started which allowed for reviews to be undertaken before any work affecting the historic environment was underway and time could be taken to discuss all possible options. Buildings and assets of historic significance were identified in baseline studies and contingencies made for those affected or in close proximity to the project. Areas being developed that contain historic buildings have been designed in such a way to be sympathetic to the character of the area, whilst planning for sustainability of the area in the future. This includes design, materials used and layouts implemented. All historical research undertaken for the project and any archaeological reports will be made publically available following project completion. As the impacts on the historic environment are hugely important, the DWDR scheme was designed to minimise the loss of historic character, which includes the retention of the Wellington Dock with a new navigable channel to/from the new marina. A Heritage Steering Group (HSG) was formed in the early stages, in order to meet the design delivery of the project’s heritage requirements. This group comprises participants from the project team and external heritage organisations and statutory bodies, and is supported by a full-time dedicated conservation officer. Through the HSG it was advised that archaeologists would be present on site for any excavation works due to the historical past of the Western Docks, Dover. Specialist heritage experts, Archaeology South-East (ASE), are contracted to oversee the excavation to ensure the requisite investigations were conducted in a controlled environment. At each stage of excavation a method statement of works was drafted and approved by the HSG, and written in consideration of any known presence of previous structures. A large amount of research was undertaken including the overview of historic maps and photographs, as well as investigation of other local archive sources. The Port produced a Client Construction Environmental Management Plan (CCEMP) which prescribed the requirements of the agreements reached with conservation bodies to be managed by the designers and contractors (e.g. protection of fiery clearwing moth habitat, habitat creation etc.) during the design and construction phases. The CCEMP communicates the ecological specifications of the project and details the ecological management requirements. For example, the document provides targets related to marine ecology, e.g. “to implement a new gate on the Wellington Dock that operates under the same protocol as the current gate, and thereby maintains the current tidal regime and therefore reduces impacts on marine species”. Marina Pier textured concrete – 1,051m and, reclaimed timber – 300m. Reclaimed timber will be bolted to the new Marina Pier base forming a structure to accommodate wildlife. Approval of the specially surfaced pre-cast concrete panelling on the new Marina Pier has been communicated to designers during the detailed design stage. The overall design of the new Marina Pier ensures that it is in keeping with the surrounding harbour area and is aesthetically pleasing to the Dover community. The wave walls have also been featured to promote important habitat for macroalgal and epifauna in the harbour – an initiative approved by the Environment Agency. It also serves a dual function as a new public promenade and as a breakwater to protect vessels in the new marina. It is unique with innovative and sustainable features including its precast modular design which harnesses the benefits of off-site fabrication to its concrete finish which creates an environmental habitat. The Port of Dover continues to run an Environmental Monitoring Programme throughout the course of the DWDR Project, including surveys of birds, marine life and terrestrial ecology. Once the construction is complete new sites will be added and will be monitored across the DWDR area. The results of this ongoing environmental monitoring are to be communicated to the public and other interested parties through an annual monitoring report. To comply with the relevant legislation, DWDR was approved under a HRO (Harbour Revision Order) granted by the Department of Transport in 2012. The HRO allows a period of 10 years for the work to be completed. Additionally, Marine Licences have been obtained from the Marine Management Organisation (MMO), where the Port of Dover can carry on activities for which licence is required under Party 4 of the Marine and Coastal Access Act 2009. To minimise the input of contaminants from roads, infrastructure and other hard standing areas, full retention interceptors will be installed in the surface water drainage in order to minimise any risk of spills and releases reaching the water body. Furthermore, the basin areas are treated as the mouth of the River Dour and therefore the drainage interceptors will reduce the risk of poor water quality affecting migratory fish. To reduce the impact from passing commercial and recreational vessels, Dover Port Control Vessel Management has implemented speed restrictions as a way of minimising sediment re-suspension. A Marine Pollution Response Plan (MPRP) was produced, which describes in detail, contingency plans for operational marine pollution. Existing water features have been incorporated in the design of the project and access to the River Dour will be via the Wellington Dock Navigation Channel rather than being re-directed elsewhere. This ensures that salinity and tidal regimes stay the same within the new marina as existed in the Granville Dock and Tidal Basin areas. An appropriately sized bypass culvert has been designed to allow the Dour to continuously drain when the stop logs (used to close the WDNA for maintenance) are installed and maintenance is underway. The existing gate regime will be maintained to ensure continued passage of migratory fish. The Port continues to undertake water quality surveys across the Port every six months. This will be continued after the project finishes, to monitor the project’s impacts on the freshwater and marine environment. The CEEQUAL assessment provided a management tool for the project team to conduct an overall review on the sustainability of the project. Throughout the process, the project team identified areas of improvement for incorporation into future project elements to enhance sustainability performance. CEEQUAL is most beneficial when implemented from conception to completion and all project elements are fully engaged in the process. The benefits include enhanced record keeping and ensuring environmental issues remain a key element of the delivery. The Port employs a full-time environmental advisor to drive the CEEQUAL Assessment initiative, recognising that time and dedication are necessary for the project to be a success.